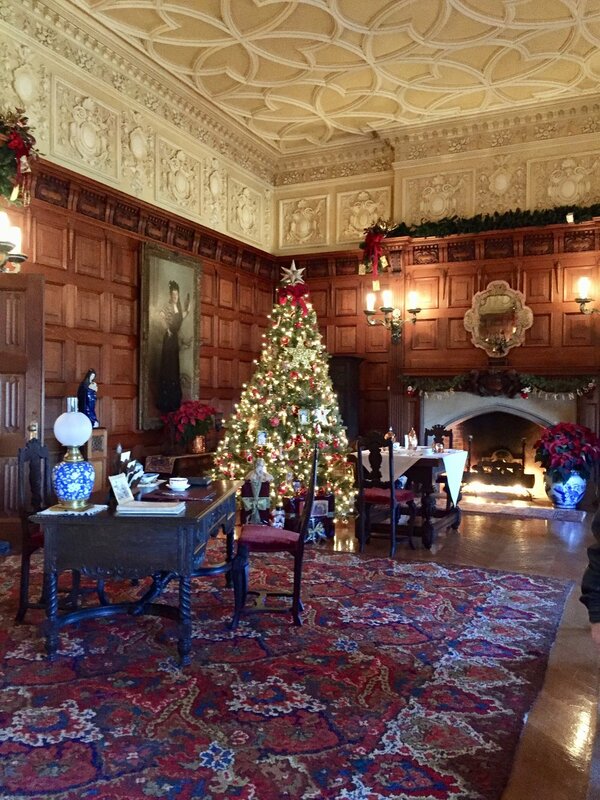 This past weekend I had the great pleasure to visit the Biltmore Estate in Asheville, NC, country retreat of George Vanderbilt. 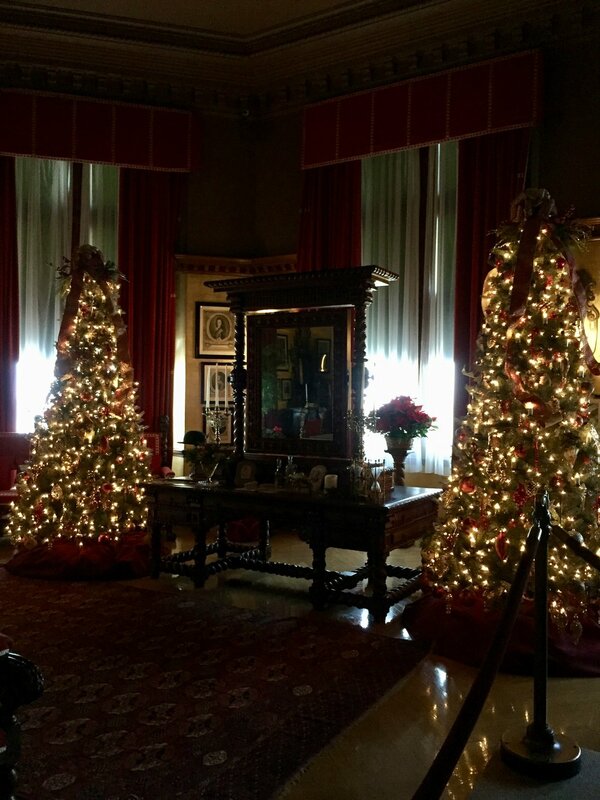 I've always wanted to see the home and to see it decked out for Christmastime was quite something to behold. It's pretty much the most impressive facade I've seen in America. The other fancy families of New York thought the Vanderbilts were very gauche, and this French chateau copy was certainly meant to give the Vandies some Old World street cred -- it is, in my opinion, the original Monster New Build. Shocker -- the Astors and their gang still thought the Vandies were tacky afterwards. Be-ribboned lions guard the front entrance. Tiled, vaulted arches surround the central winter garden. The winter garden has the most gorgeous clerestory. Gothic revival detailing abounds, and definitely gives the home a "fairytale" feeling. The fireplace in the grand dining room is absolutely immense. 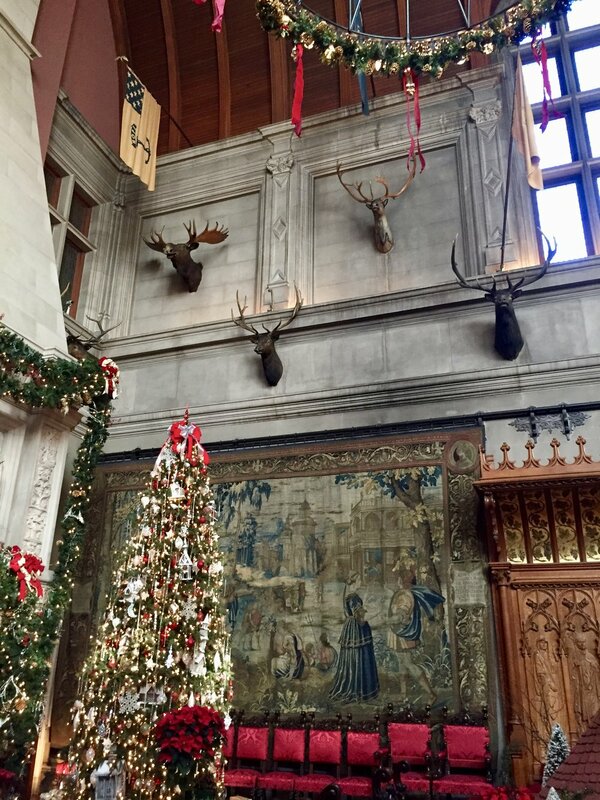 The vaulted and beamed ceiling in the dining room is hung with the flags of the original 13 states, a very American take on the European tradition of hanging heraldic symbols. The dining room was insane but also weirdly sublime. I just tried not to think about it so much. The hall leading into the library was very cozy and a favorite hang-out spot of the family. Painted overmantels were deocrated with medieval-ish hunting and animal images. The somewhat normal scale of this space made is so comfortable and welcoming. The plain green upholstered furniture was plain and handsome. The library was pretty spectacular. It quite reminded me of the library in "Beauty and the Beast." There were secret doors from the guest bedrooms into the upper level of the library so you could pop in at night for a book and nip back to your room, which is quite considerate. You bet your bottom dollar I wanted to hop in that ginormous Chinese pot. George's insane bedroom has real-gold leaf on the walls. Yeah, I get why the blue blood Knickerbocker New Yorkers didn't like them. This sort of late-Victorian, dark, burgundy velvet cave is precisely the thing that motivated Elsie de Wolf and Edith Wharton to reject heaviness and decorate in a lighter, brighter, Georgian revival style. Thank heavens. 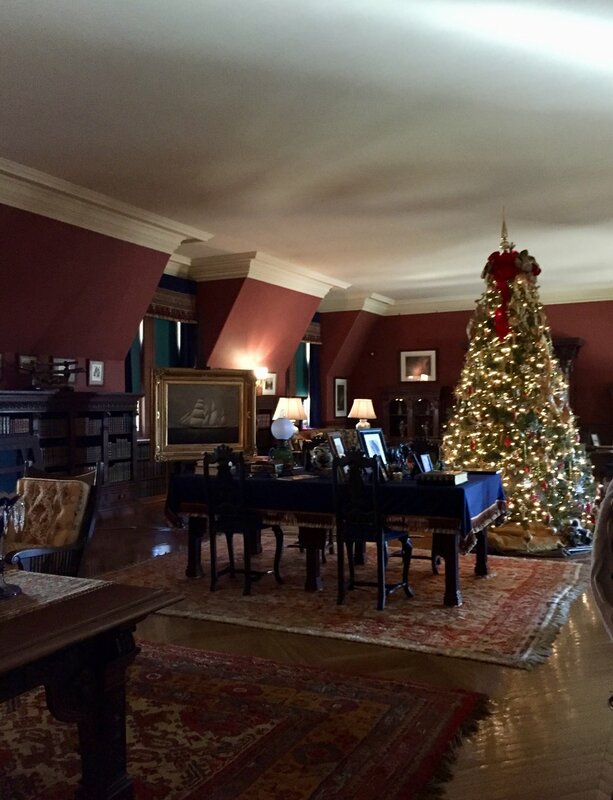 This shared sitting room, which connected Mr and Mrs. Vanderbilt's bedroom's was my favorite room in the house. Impressively scaled and decorated, but very comfortable and livable. It was a favorite space for light breakfast or tea. 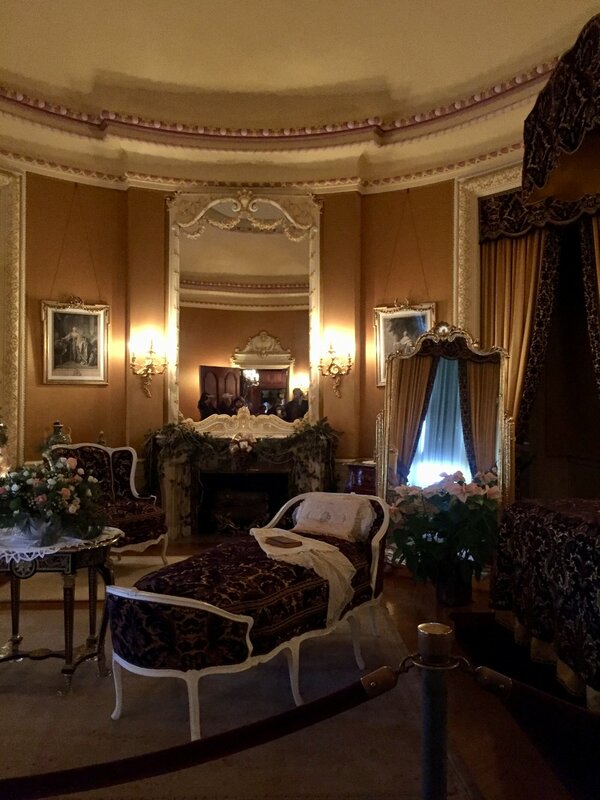 Mrs. Vanderbilt's bedroom was inspired by their Parisian honeymoon. It is decorated in the royal colors of gold and purple. Subtle, guys. Another more casual sitting room is tucked beneath eaves. The central staircase was spectacular. There were oodles of guest bedrooms. This red damask one is very on-trend for 1895. However, red damask gives me nightmares. This bedroom featuring blue wallpaper and ochre moulding and millwork was charming. The Tyrolean ceramic overmantel in this bedroom is floral and feminine. The greenish-taupe, petite printed wallpaper in this bedroom is actually quite English and lovely. 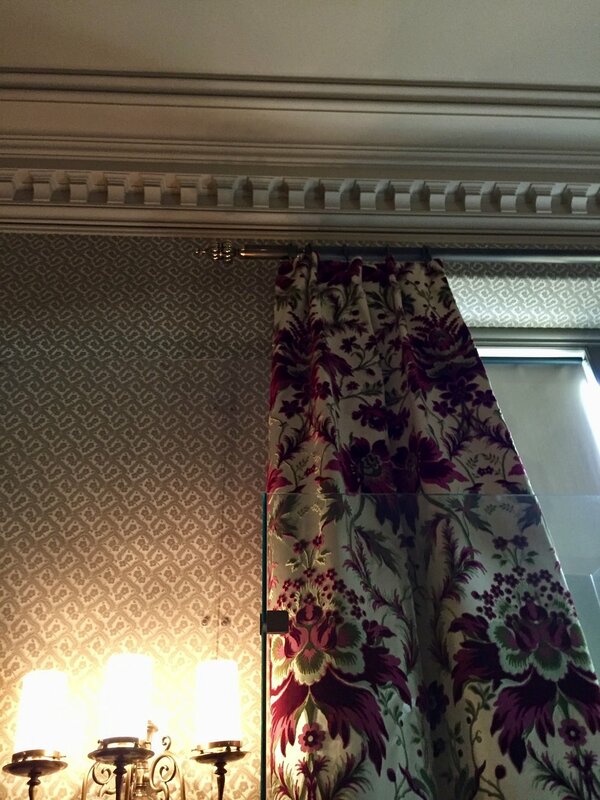 The combination of the petite printed wallpaper and the cut velvet floral draperies were very pretty. The "Louis XV" room is over-the-top, but surprisingly comfortable. 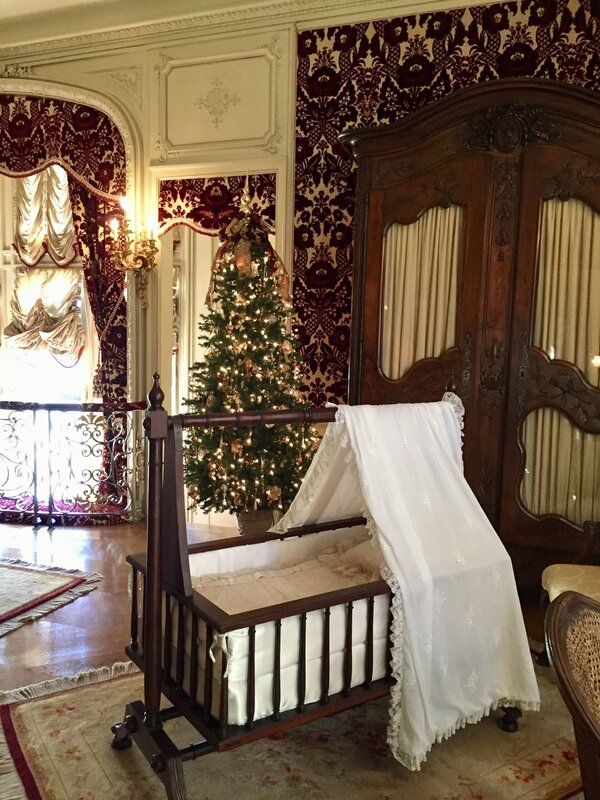 The space was a favorite of the family's and several of Mrs. Vanderbilt's children were born in this room. 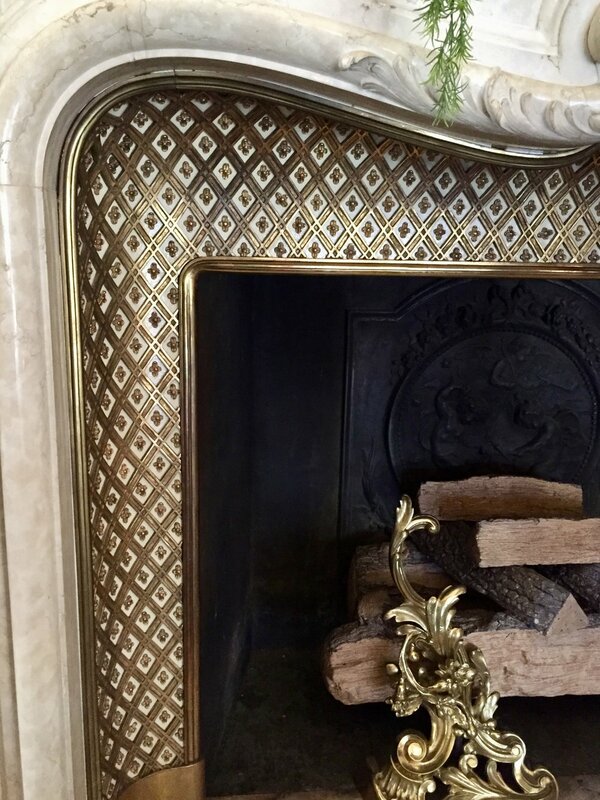 The brass detailing around the fireplace was too lovely to be missed. I could've stared at the garland-festooned staircase all day. There were multitudinous activities available in the home and on the estate, like bowling! The indoor swimming pool was impressive, if not the teeniest bit creepy, and a dream for a subway tile lover like yours truly. 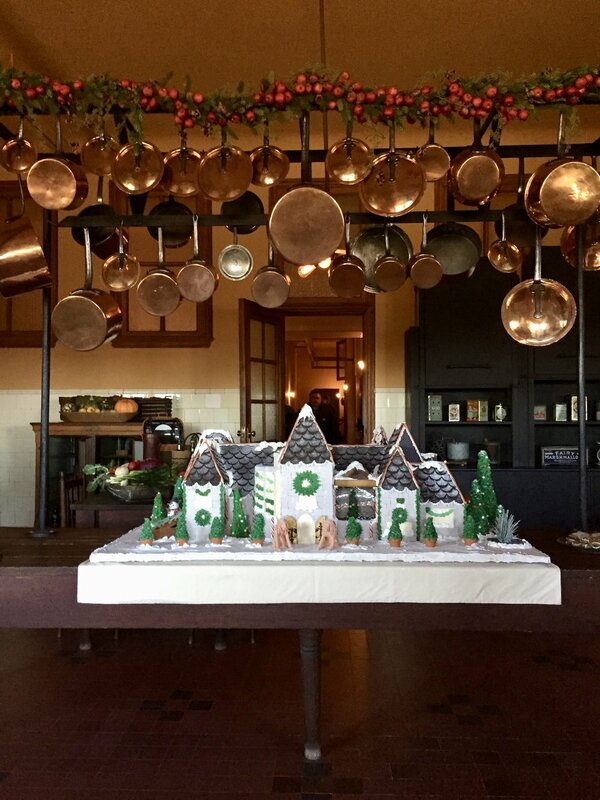 The kitchens were extensive and this gingerbread model of the home was adorable. This room, just filled with vases and other vessels for flowers was filled with blue and white ceramic goodness. This paneled billiards room was the ultimate man-cave. This last room in the "bachelor's wing" was a shooting lounge. This spectacular built-in cabinet contains Mr. Vanderbilt's collection of shotguns that his guests could borrow to go shooting on the estate. Leland diligently listened to every single room description on the audio guide. I was so proud. The home felt especially French with these beautiful, bare winter trees and vines. The Biltmore is surrounded by acre upon acre of rolling lawns and gorgeous mountain views. I've always wanted to see this home and it was such a treat to see it dolled up for Christmas. A fairytale come to life.